Resurs-P1 was launched on the 25th of June 2013 from Baikonur Cosmodrome and accepted into regular operation on the 30th of September 2013. Resurs-P2 was launched on the 26th of December 2014 from Baikonur Cosmodrome. Resource-P3 was launched on the 13th of May 2016 from Baikonur Cosmodrome. The spacecraft is capable of photographing individual targets on the Earth surface, as well as long stretches of Earth surface extending as far as 2,000 kilometers. 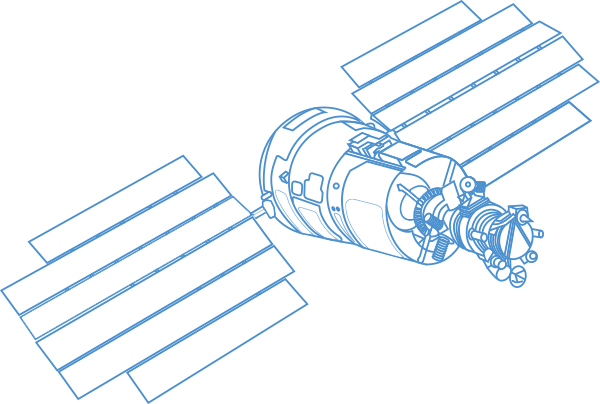 Resurs-P could also image areas 100 by 300 kilometers during a single pass and conduct stereo-imaging. 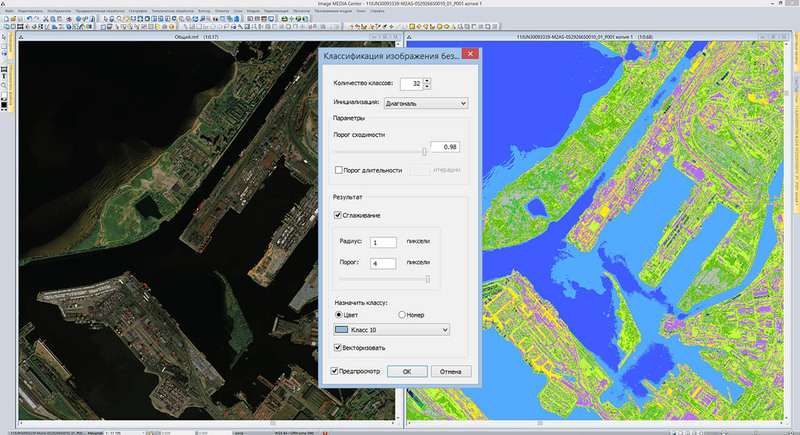 Resurs-P is designed for maps update, environmental control and protection; among the users of the satellite data there are following institutions: Ministry of Natural Resources, Ministry of Emergency Situations, Ministry of Transportation, Ministry of Agriculture, Ministry of Fishing, Ministry of Meteorology and other domestic and foreign customers. 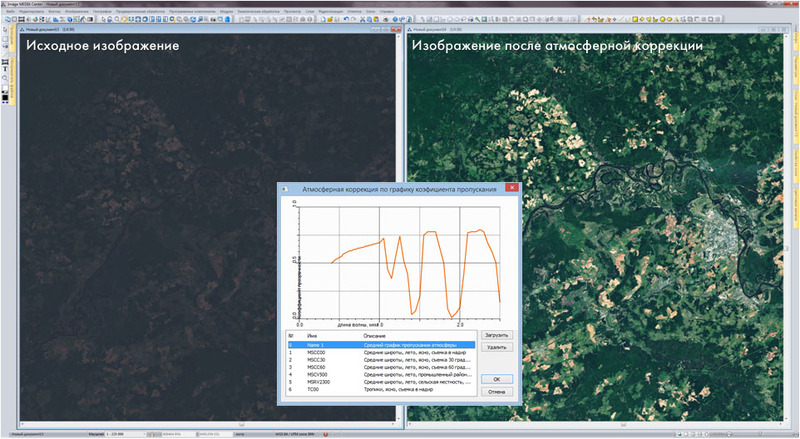 Kanopus-V1 is a Russian spacecraft designed for real-time technogenic and natural disasters monitoring. It was launched on the 22th of July 2012 from Baikonur Cosmodrome. 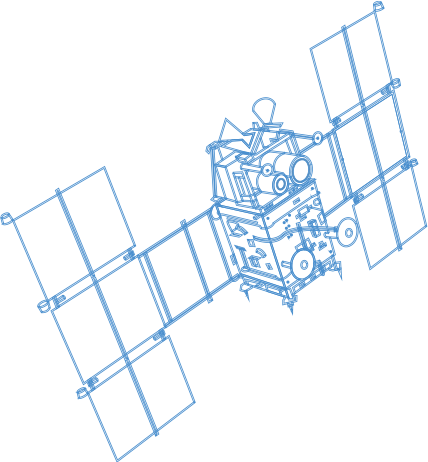 Data acquired from Kanopus-V1 spacecraft contain RPC-for faster image processing and image accuracy improvement. BKA (Belorussian spacecraft) was launched together with Russian Kanopus-V1 and has identical characteristics. Scene’s metadata file is stored in the data package along with the image in XML or TXT file formats. IMC provides a possibility to read metadata files and open related scenes automatically. Characteristics of color bands such as range, width, gain, offset, along with the satellite and sensor type, surveying date and time, resolution, and information about cloud coverage will be read and filled automatically. All of the information read from the metadata file is useful for further image processing. Atmospheric correction is required for further thematic processing of the image. User can select one of listed atmosphere transmission plots or upload a new one. 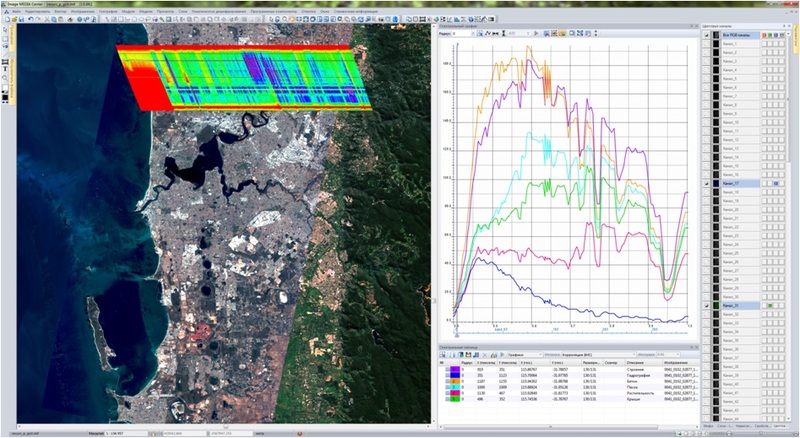 Here you can see Landsat-8 image and averaged atmosphere transmission plot. On the left there is an original image, on the right – image after atmospheric correction was performed. 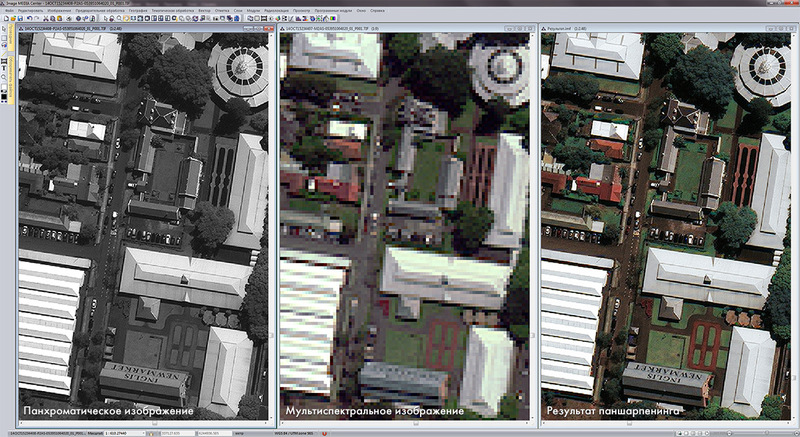 Pansharpening is a process of merging high-resolution panchromatic and lower resolution multispectral imagery to create a single high-resolution RGB image. 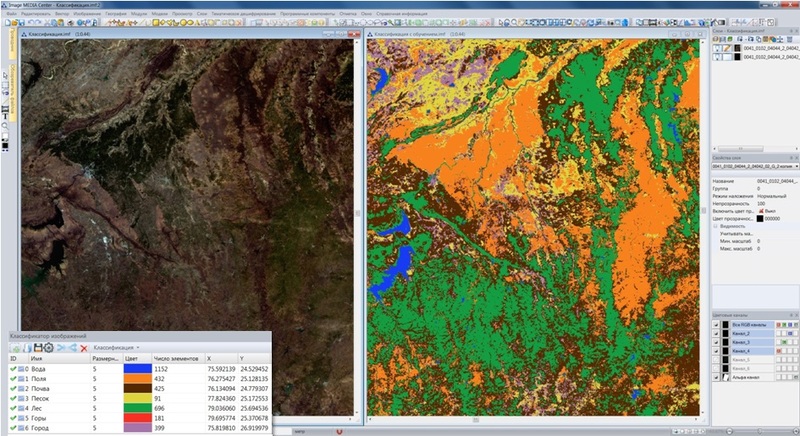 Thematic processing methods provide a possibility to perform a detailed analysis of the satellite imagery and create vector maps filled with attributive information as the result of the processing both manually and automatically. 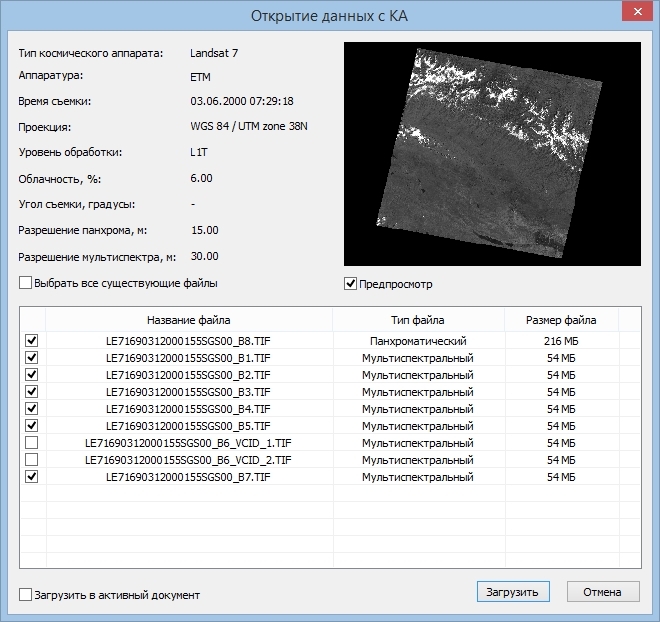 There are various algorithms for remote sensing data thematic processing implemented within Image Media Center software. using various color spaces (RGB, CMYK, Lab, HLS, HSB). 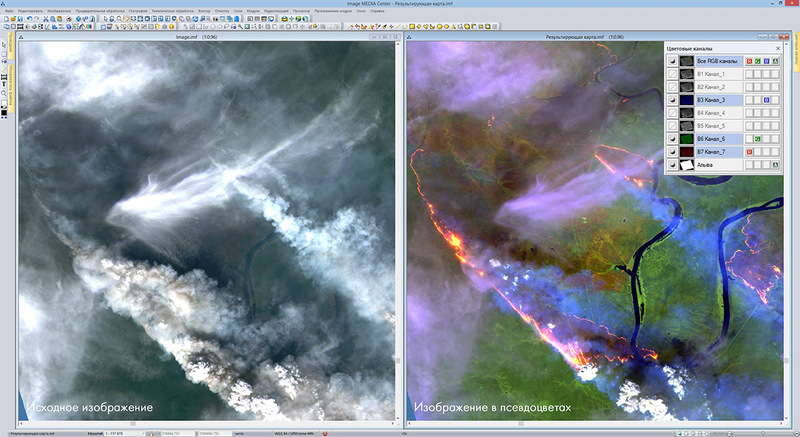 On the left image you can see the original image obtained from Landsat-8 satellite; on the right – false color image (bands 7-6-4). Pixel brightness values of index image are the result of mathematical operations on brightness values of each pixel for different color bands. “Band calculator” tool is designed to create index images; it allows user to perform various mathematical operations on spectral bands. 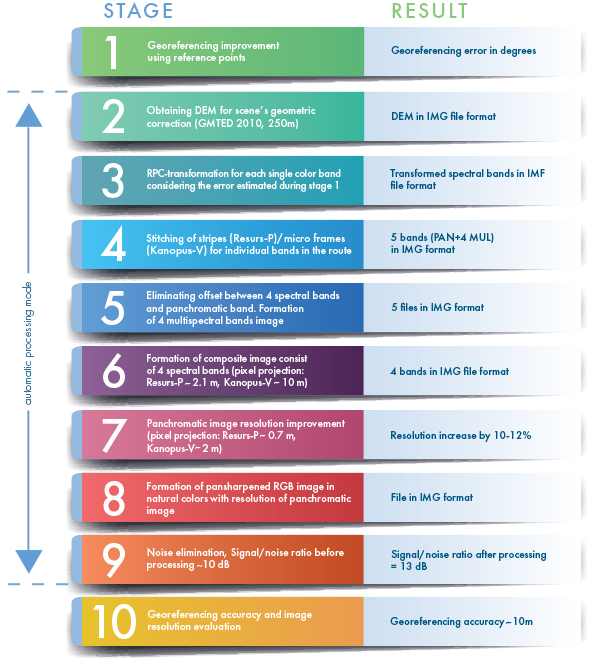 To create a land surface temperature map a sequence of auxiliary calculations should be performed (such as spectral emissivity, surface brightness temperature, etc. 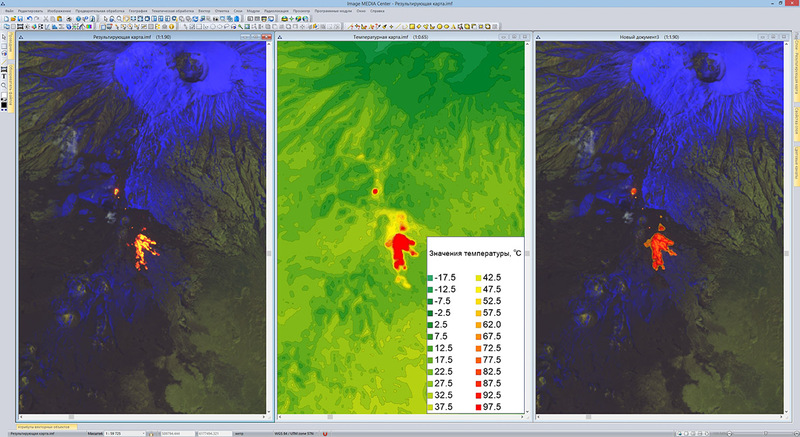 ), obtained values can be converted into various units of temperature; a universal color range is used to create a colorful land surface temperature map. Temperature maps allow user to detect areas of abnormal temperatures and discover wildfires and burned areas. auxiliary step before supervised classification. Supervised classification requires manual preparation where operator determines reference areas on the image for each class of objects. For classes recognition pixel brightness values of reference areas are used for each spectral band. Thus each pixel of the image will be assigned to a certain class as a result of consequential comparison with all selected references. 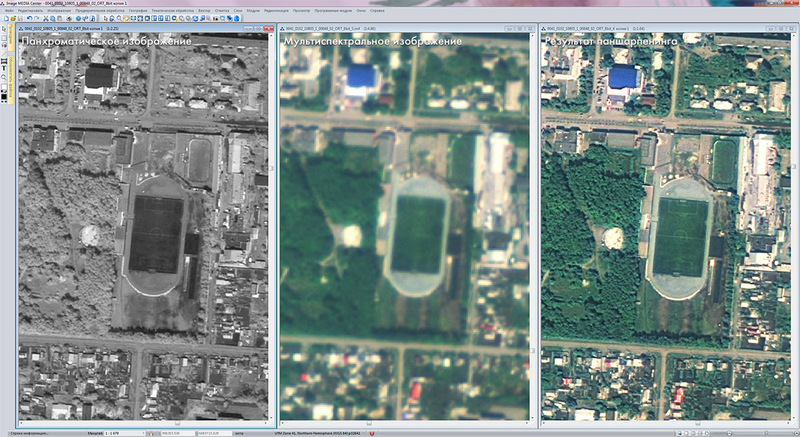 On the image you can see the result of the supervised classification based on Resurs-P ShMSA-SR data. On the image you can see hyperspectral image by Resurs-P satellite, spectrogram for the row of pixels, and spectral plots for different types of objects. IMC software allows user to create vector objects of any complexity (markers, lines, polygons, complex objects), create and assign custom display styles for vector objects, create vector classifiers for different types of objects, scale factor, and attribute data. Vector layers can be saved in popular file formats SHP and the TAB, as well as in the IMF file format which allows user to store raster and vector layers with attribute information in a single file. For comprehensive analysis of the results of the processing, statistical reports can be generated automatically. 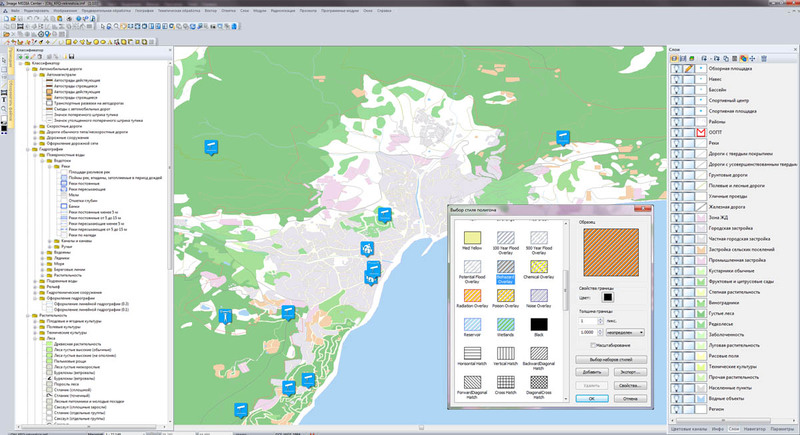 Reports can contain all types of visual representation of statistical data such as graphs, legends, information about the scene etc., as well as satellite images and thematic maps. User can create custom report drafts for convenient demonstration of the results of various thematic processing. 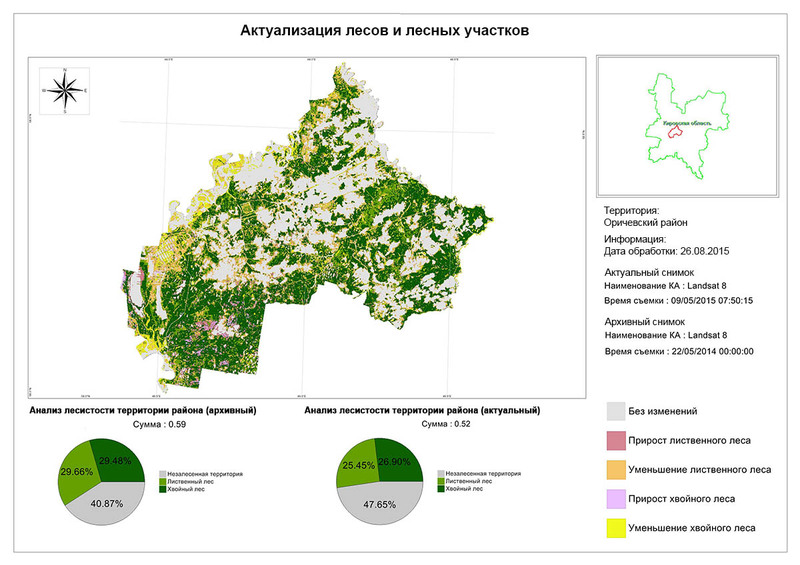 On the image you can see the report that demonstrates the forest cover change over the period of monitoring based on multi-temporal analysis of Landsat-8 images.